You'll be £25.00 closer to your next £10.00 credit when you purchase Wellington's Voice. What's this? LIEUTENANT COLONEL JOHN FREMANTLE WAS on Wellington's personal staff through the later years of the Peninsular War and the Waterloo campaign. He had a uniquely privileged view of the general and in this fascinating new book, which brings together a collection of personal letters written to his uncle, he speaks candidly of his exploits – good and bad. Fremantle deals with military matters in fascinating detail and gives a great insight into Wellington's honest views of matters – not the sanitised diplomatic versions Wellington allowed to be published in later life. He also talks a great deal about the personalities in 'Wellington's family' and the 'Great Man', giving very open, forthright views of their strengths and failings, and brings many little-known incidents to light. He describes the back-stabbing, the one-upmanship and the intriguing within Wellington's inner circle, and reveals the foibles of the duke himself; his philandering, his irascible nature, and his own petty intrigues and jealousies. An exposé of what life was like working with Wellington and an honest portrait of the man warts and all – this is a truly remarkable find by Gareth Glover and will certainly cause debate in the Napoleonic community. Lt Col John Fremantle was on Wellington's personal staff through the later years of the Peninsular War and the Waterloo campaign. He had a uniquely privileged view of the general, and in this fascinating book brings together a collection of personal letters written to his uncle in which he speaks candidly of his exploits - both good and bad. 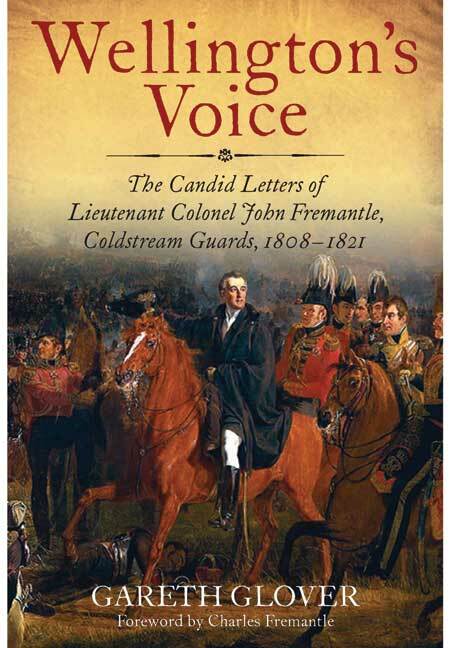 Wellington’s Voice is a collection of over 300 letters written by John Fremantle over a 29 year span from 1808 to 1837. The vast majority of these letters cover his time in the Peninsula and the Waterloo Campaigns. Once again Gareth Glover should be commended for rescuing such important primary source material from obscurity. As usual he does his normal superb job placing the letters in context of the events that were occurring at the time and of course, providing annotations on the various individuals, places, and events, mentioned in them. I strongly recommend Wellington’s Voice for anyone interested in the Peninsular War and particularly those interested in the functioning of an army staff. This is a very refreshing look at Britain's greatest military general a seen through the eyes of one of his subordinate staff, Colonel John Fremantle. It is a very timely publication offering a far more human look at The Duke of Wellington, so that we gain insight into the politics of his inner circle, the problems he had to overcome, and his often irascible temper.